3 CD set from the Knickerbocker Arena in Albany, NY from March 24-25-26, 1990. Don't let the title fool you - the music on this new three-CD set (the fourth in a series of multi-track gems from The Vault) is anything but sleepy. In fact there's enough joyful noise here to rouse even ol' Rip Van Winkle himself from his fabled slumber. Recorded when the Grateful Dead was on one of those rolls (the hot 1990 spring tour, which also featured the band's famous first encounter with Branford Marsalis), this set is culled from three nights in New York's state capital, the Dead's first appearance at a venue that became a Deadhead favorite. This is a kind of composite "dream show" and then some, with a "first set" assembled from highlights of the first two nights, followed by the entire second set from 3/25, and a bonus chunk of night #3, set #2. Among the tunes appearing for the first time on a live Dead album are "Dupree's Diamond Blues," "Just A Little Light," "Row Jimmy," "Blow Away" and "The Wheel." Appearing for the first time anywhere are Brent Mydland's "Never Trust A Woman" and the ever-popular "Mud Love Buddy" Jam. All this and much more, with the band in peak form, beautifully mixed from the multi-track master tape by producers Phil Lesh and John Cutler. 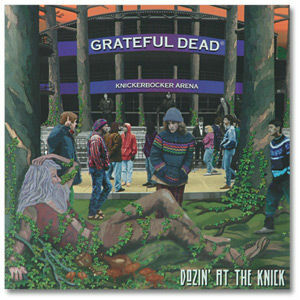 "The Knick" is Knickerbocker Arena in Albany, New York, one of the best East Coast venues the Dead frequented in the '90s. This three-CD set was taken from the band's March '90 shows there. For me, the first disc is spoiled by two Brent tunes I never cared for, "Never Trust a Woman" and "Blow Away," though I like the versions of "Dupree's Diamond Blues," "Just a Little Light" and "Jack-A-Roe." It's a strange, disjointed first set they've put together here. Disc Two is outstanding, with "Playing in the Band" segueing into "Uncle John's Band," and a powerful "Terrapin" that leads into a long, melodic jam before "drums." (This jam is frequently referred to by Deadheads as the "Mind Left Body" jam, referring to a very similar chord progression found in Paul Kantner's 1973 song "Your Mind Has Left Your Body," on the album Baron Von Tollbooth and The Chrome Nun, and which featured Garcia. On this CD the jokesters at GDP call it the "Mud Love Buddy" jam; a silly name I refuse to use. Knowing the notoriously frugal Dead, they're probably afraid they'd have to pay Kantner royalties if it were called the "Mind Left Body" jam.) Disc 3 contains the post -"drums" of two different shows (3/24, 25) - one featuring well-played versions of "The Wheel" (still the only official live version available), "Watchtower" and "Stella Blue"; the other "I Will Take You Home," "Goin' Down the Road" and "Black Peter." Solid all the way around.